This is a map of the magnetic field of Mars observed by the Mars Global Surveyor satellite at a nominal 400 km altitude. Red and blue stripes represent magnetic fields with opposite directions. Darker hues represent more intense magnetic fields. To show the location of the magnetic stripes on Mars, the map is superimposed on a topography relief map from the Mars Observer Laser Altimeter instrument. A new high-resolution map of Mars's magnetic field indicates that the red planet's crust once moved like present-day Earth's. The map was pieced together from observations of Mars's magnetic field taken by NASA's Mars Global Surveyor (MGS). It reveals that the planet's surface was shaped in the same manner as Earth's - by giant crustal plates pulling apart or smashing together. In 1999, MGS provided a glimpse of this type of activity over one region in the Southern Hemisphere. The new map is based on four years of data and covers the entire planet, yielding evidence that some of the main features on Mars, such as the Tharsis volcanoes and the Valles Marineris, were created in part by the same processes that created the Hawaiian Islands and Grand Canyon on Earth. Crustal plates sit on top a layer of molten rock called the mantle, and when they slide around, they produce a pattern scientists refer to as "striping." As molten rock rises from the mantle, it breaks through the crust, pushing the plates apart. Once the molten rock reaches the surface, it cools and is magnetized in the direction of the planet's magnetic field. Later on, this new surface will likewise be split apart by more rising material. On Earth, the magnetic field flips direction a few times every million years, so a flow that rises and cools in one period may have a different magnetic orientation to the one next to it. These alternating stripes are proof of both a strong magnetic field and tectonic activity. Activity like this is widespread on Earth - particularly along the Mid-Atlantic Ridge - but had never been confirmed on Mars until this latest study. "This map lends support to and expands on the 1999 results," said Norman Ness of the Bartol Research Institute at the University of Delaware. "Where the earlier data showed a 'striping' of the magnetic field in one region, the new map finds striping elsewhere. More importantly, the new map shows evidence of features, transform vaults, that are a 'tell-tale' of plate tectonics on Earth." Confirming that Mars experienced plate tectonics at some point in its history helps explain some of the mysteries of Mars geology. The Tharsis volcanoes - which include the largest volcano in the solar system, Olympus Mons - lie in a straight line, but until now, scientists couldn't say why. With the new map, it is likely that they were formed from the motion of a crustal plate sitting over a "hotspot" in the mantle, just as the Hawaiian Islands are thought to have formed. The Valles Marineris is a large canyon six times as long and eight times as deep as the Grand Canyon. It is 2,800 miles long, 125 miles wide, and nearly seven miles deep. Its features resemble what a tectonic plate being pulled apart would look like on Earth, and its stripe pattern is oriented in a way that scientists would expect from the plate motions implied by the new map. 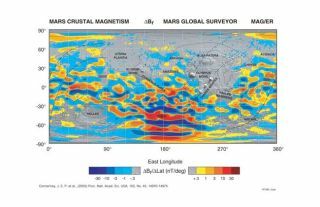 "It's certainly not an exhaustive geologic analysis," said Mario Acuña, principal investigator for the Mars Global Surveyor magnetic field investigation at Goddard Space Flight Center. "But plate tectonics does give us a consistent explanation of some of the most prominent features on Mars." This research was detailed in the Oct. 10 issue of the journal The Proceedings of the National Academy of Science.